DHT, Dihydrotestosterone, is a daunting word for people with hair loss problem. Those who suffer from hair loss need to understand how DHT induces hair loss and balding. Thus, staying informed about the effects of DHT on your scalp and about remedies available to mitigate its effects can help those who suffer to fight the effects. For most people, hair loss is hereditary since the genes for hair loss can be inherited from either side of the family. Some studies even indicate that the genes from the mother’s side are easily passed along to the male offspring. The human body naturally produces an enzyme known as Type II alpha reductase in the hair follicle oil glands, which then induces testosterone to condense into an androgen derivative known as Dihydrotestosterone (DHT). 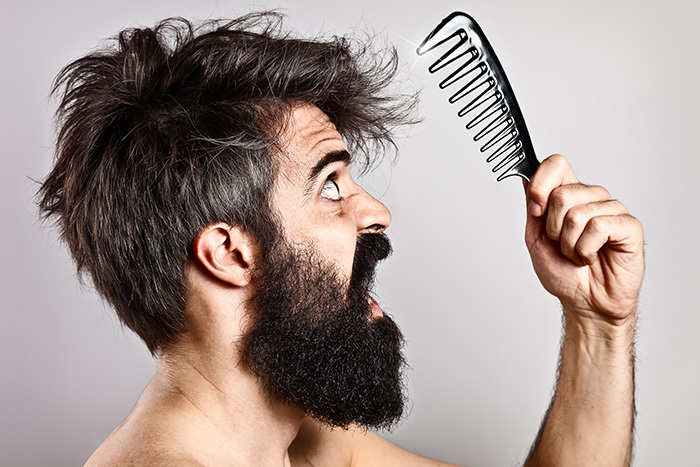 Scientists used to believe that the levels of testosterone effect hair growth, but recent studies have shown that levels of DHT effect hair loss since it binds easily to the scalp follicles. The binding of DHT to scalp follicles induce hair loss by shrinking hair follicles which makes it hard for healthy hair to survive and new hair to grow. As long as you still have some hair or hair roots, we CAN help you fight DHT induced hair loss. Regular treatment with Saini Herbal Scalp & Hair Conditioner® will help your hair to grow strong and healthy!! !